It’s bad enough that many women suffer from horribly painful periods (dysmenorrhea), each month, but those women with endometriosis Nausea and vomiting are also a common occurrence. This Endometriosis Nausea can also be a sign that misplaced endometrial lining had attached itself to your gastrointestinal organs. In this article, I’m going to explain how and why this happens and most importantly show you how to relieve nausea with one simple pressure point. Endometriosis is a disorder in which bits of tissue from the inner lining of the uterus (the endometrium) grow inside a woman’s body, but outside of the uterus. The uterus is a hollow organ within a woman’s abdomen where a fertilized egg is implanted and develops into a baby normally over a period of nine months. The endometrium is a lining of the uterus that separates the myometrium from the uterine cavity. During a woman’s menstrual cycle, the uterus sheds off the endometrial lining in the form of a thick, glandular, blood vessel-filled tissue in response to the body’s hormone production. Endometriosis may seem similar to a regular menstrual cycle in the sense that the endometrial lining is still sloughed off. However, in the case of endometriosis, not all of it is excreted. Instead, some of it gets misplaced and transported to other organs in the pelvic cavity. 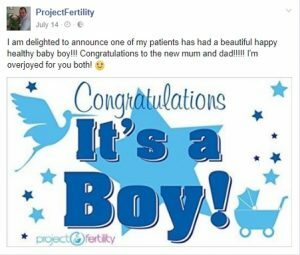 It may attach itself to the bowel, bladder or small intestines among other organs, causing infection, scarring, and worse – infertility. How Does Endometriosis Cause Nausea? If endometrial cells grow outside of the uterus they can attach on to bowel, bladder and small intestine all of which are needed to properly break down your food and fluids. For instance, if endometrial tissue grows on the bowel walls it can block movement through the bowel and started causing issues with how the bowel works. With the bowel not working correctly, the entire gastrointestinal tract will become affected and eventually nausea will present. This is often due to a build up and backlog of gastric juices that cause nausea. Another aspect is the pain. The development of masses and cysts, trapped blood and the tearing feeling of tissue as it tries to pull away from things it should never have been attached to causes incredible pain each month for a woman if she suffers from endometriosis. This pain, combined with a lack of blood leads to spasm and cramps through the entire gastrointestinal tract which in turn causes terrible endometriosis nausea. The degree to which the symptoms present and their severity can vary from person to person. Sometimes it is simply a slight cause of nausea at varying points in the day, in others, it can be quite extreme with violent vomiting. Often women suffering from endometriosis nausea restrict their food. Simply put, they just don’t feel like eating. This isn’t ideal and there is a real concern that with the reduction in food and combined with vomiting, vital fluid will be lost and the body can become dehydrated. Excessive vomiting may lead to hospitalization to receive intravenous fluids. Dehydration can be monitored in a number of ways – checking the ketone level in urea (ketone sticks are available in most pharmacies). This helps to monitor electrolyte and hydration levels. The stick indicating the severity of the ketosis. Of course decreased urination or heavily concentrated urination is an obvious indicator that the body may be dehydrated. A common cause of Endometriosis according to Traditional Chinese Medicine (TCM) is a condition called Liver Qi Stagnation a condition where the movement of blood in and out of the Liver is slow or stagnant. This is a fancy way of saying that the function of the Liver is compromised and not working as well as it should. So what does the Liver do and why is it important here? Produces important proteins that affect the blood, such as factors that are essential in making the blood clot after an injury. In terms of its effect on nausea the liver aids in stabilizing blood sugar levels, and produces bile, which aids in the digestion and absorption of fats. This is an important factor for concerned with maintaining a specific weight, those who maybe diabetic, suffering from an irritable bowel and it also aids in maintaining a slim waist line and healthy aesthetics. Bile additionally works for the absorption of substances such as vitamins A, D, E, and K and medication that patients take as an immunosuppressive agent following liver transplantation. The bile is stored in the gallbladder (which is located just below the liver) and then released into the intestines as needed. Together, these organs process the nutrients found in the foods we eat. The liver also helps filter many chemical substances and waste products from the blood. Most medicines are cleaned from the bloodstream by the liver. And for those interested in the post training pint or two the liver also removes any alcohol that’s consumed from the body. What Causes Liver Qi Stagnation? The most common reason for the development of Liver Qi Stagnation is chronic exposure to feelings of frustration, bitterness, anger, repressed anger, anxiety, and worry. All very common emotions, particularly in the world today, and most especially when dealing with conception difficulties. These emotions, if present over a long period of time or in excess, disturb and prevent the free flow of blood and energy in the body, which injures the functioning of the internal organs. This is due to the presence of cortisol (the stress hormone) in the blood, which slows and thickens the blood, taking it from a free flowing healthy red and turning it into darker, clotted, congealed fluid. This is turn can cause the development of masses and cysts as we see in in Endometriosis. These blockages cause pain. A lot of it. Meanwhile, the Liver cannot remove toxins and cannot absorb nutrients from our food. The Liver swells slightly ejecting excess Bile (gastric juices) into the digestive tract causing nausea, vomiting, epigastric pain, no appetite, belching etc. Thankfully several studies have shown that we can treat endometriosis and nausea effectively using natural medicine. One recent study investigating the effects of traditional treatment on just the pain of endometriosis alone found that “The total effective rate (‘cured’, ‘significantly effective’ or ‘effective’) for auricular acupuncture and Chinese herbal medicine was 91.9%” . (Zhu, Xiaoshu, Kindreth D. Hamilton, and Ewan D. McNicol. “Acupuncture for pain in endometriosis.” Sao Paulo Medical Journal 131, no. 6 (2013): 439-439). Another report in The Journal of Reproductive Medicine 2001 Sep;46(9):811-4, published a study by Slotnick RN undertaken to evaluate the safety and effectiveness of P-6 for the relief of nausea and vomiting. Both this study and a similar one conducted by Dundee et al., Evans at el., 1993 conclusively showed that proper stimulation of the acupuncture point reduced nausea and vomiting in patients. I’ll show you how to simulate that exact point next. 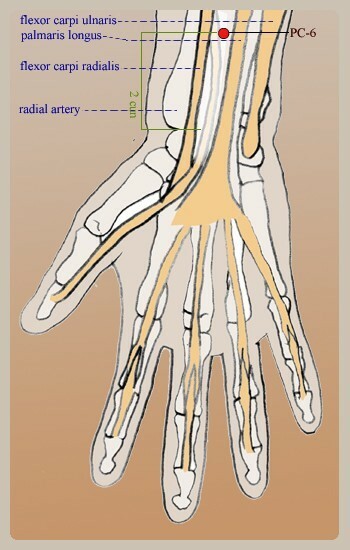 Massage this point in a clockwise direction 3 times a day for 30 seconds, alternating each side of the body. So for instance, in the morning do all points on the left side, for the afternoon the right…and so on. Press into each of these points slowly and gradually until you feel a dull aching radiating sensation. Keep at this pressure until that feeling has dissipated. About 30-60 seconds should be all you need, but if it hasn’t eased out continue to the pressure until it has. Pericardium 6: Located on the inside of the forearm, in between the tendons, approximately 2.5 finger widths below the wrist crease. An excellent point used to reduce irritability, anxiety, and stress. It also helps regulate discomfort and pain in the hypochondriac region and chest, improves poor memory, insomnia, stomach ache, nausea, vomiting, wrist pain, and neck aches. When it comes to dietary changes, the first priority should be the elimination of phytoestrogens and xenoestrogens. Phytoestrogens are compounds found in plants that stimulate estrogens or even cause the production of estrogens, in the human body. They are most commonly found in soya. Avoiding soya is important, but if you cannot, for example, if you are vegan, you must consume fermented soya, like tempeh, to remove the phytoestrogens. Avoiding xenoestrogens is all about avoiding milk and meat from animals that have been given growth hormones, as this is where these compounds are found. When it comes to supplementation you want to increase your intake of vitamins ACE, of iron, and of Omega oils. This is because all these nutrients improve immune function, and replenish nutrients lost during the excessive bleeding that happens. When it comes to meditation and relaxation you need to make sure that you are not too overworked or over stressed. Many women work long hours, do all the housework at home, and fret and worry about every little detail of every day in their spare time. This wreaks havoc on our hormones, as the key to handling stress is actually testosterone, which we do not have a lot of. The end result of chronic stress in women is often PCOS or endometriosis. By engaging in mindfulness and meditation we can fight stress at its roots and alleviate our symptoms. Finally, don’t forget to book your 1-on-1 coaching session with me, so we can figure out what’s going on and get it sorted ASAP. 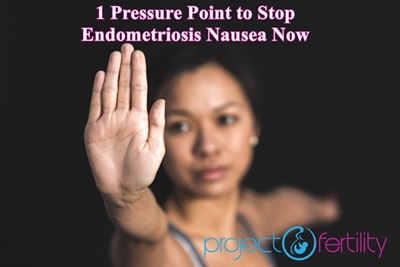 You’ve been reading about Endometriosis Nausea and How to Fix it. Learn more about working with me to help you do this – here.